A creative cross-roads where the latest in technology meets traditional arts in the public eye. Help us shape the future of the Arts and Innovation Hub. We are looking for specialists in the fields of culture, creative technology, small manufacturing, artisanal retailing, food and beverage creation and restaurant concepts, to help us develop a refined vision of the Arts and Innovation Hub. Whether you are an entrepreneur with a concept that could be operating in the Arts and Innovation Hub, or a thought-leader in your field with ideas on how we can make the Hub even more exciting, we want to hear from you. Your ideas will help us shape this unique concept community. A new destination and experience focused on arts and innovation. An animated, creative, collaborative and interactive public space. 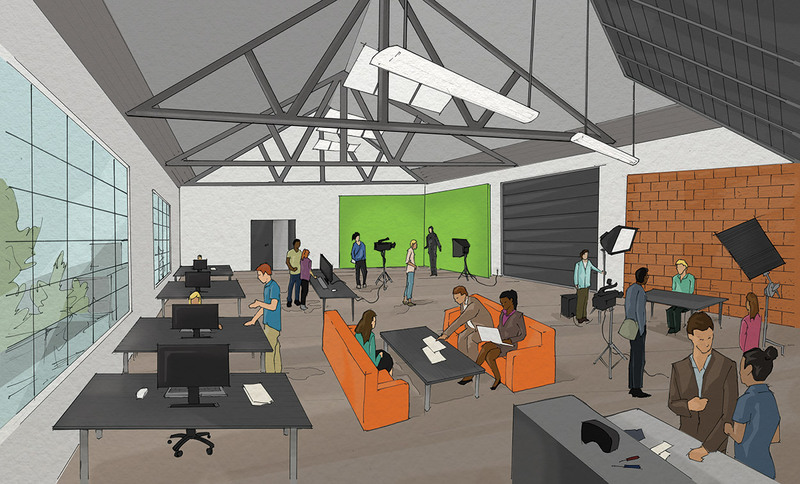 A space for innovation with a focus on the creative sectors. A mix of non-profit and for-profit enterprises. A space for environmental sustainability. A place of opportunity for local First Nations. The purpose of the Call for Ideas is to refine the vision for the Arts & Innovation Hub. By learning about ideas for the utilization of the building, interested individuals and organizations, Granville Island will better understand the opportunities, challenges and potential gaps in the current vision for the Arts & Innovation Hub. The redevelopment process for the building is anticipated to be a multi-year and multi-phase process. The present Call for Ideas is a preliminary phase and will assist with the refinement of the vision for the Arts & Innovation Hub. A formal Expression of Interest process is targeted for 2019. Granville Island would like to acknowledge Musqueam artist Debra Sparrow. 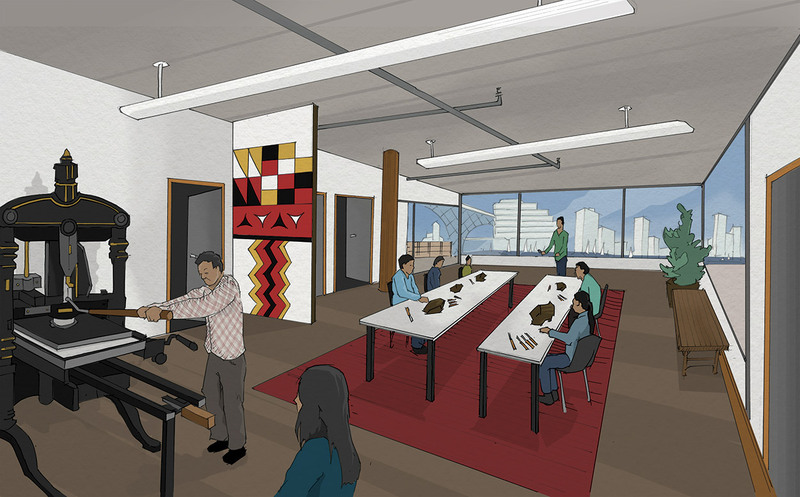 Debra’s work “Blanketing the City” was the inspiration for the artwork depicted in this illustration. 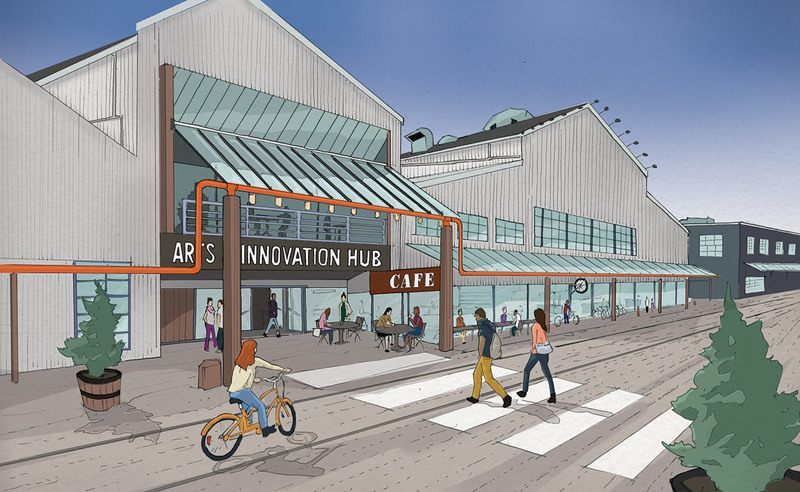 What is the Arts & Innovation Hub (The HUB)? The HUB is in the former Emily Carr University North Building, at 1399 Johnston St, Granville Island, Vancouver. Based on research and consultation for the Granville Island 2040: Bridging Past & Future plan, the vision for the space is to provide production, presentation and learning space for artists, makers and technology creators, as well as creating opportunities for public engagement and inspiration. Why are you issuing a “Call for Ideas”? Why not issue a call for Expressions of Interest as is usually done? The redevelopment process for the building is a multi-year and multi-phase process. The purpose of the Call for Ideas is to refine the vision for the Arts & Innovation Hub. By learning about ideas for the utilization of the building for interested individuals and organizations, Granville Island will better understand the opportunities, challenges and potential gaps in the current vision for the Arts & Innovation Hub. By signing up to participate, you will receive invitations to tour the building and attend information workshops, updates on the hub’s progress, and notice of the formal call for Expressions of Interest. We are looking for ideas from participants who are specialists in the fields of culture, creative technology, small manufacturing, artisanal retailing, food and beverage creation and restaurant concepts, to help us develop a refined vision of the Arts and Innovation Hub. We want to learn how participants would see their idea contributing to the successful development of the Arts & Innovation Hub. Your ideas will help us refine the vision for the future development of the Arts & Innovation Hub. How do I participate in the Call for Ideas process? Attend Upcoming Building Tours - We will be hosting a series of information sessions and building tours over the summer. These sessions will be opportunities to learn more about the process and see the building. Do I need to participate in the Call for Ideas process if I am interested in submitting an Expression of Interest for space in the Arts & Innovation Hub? No, you do not, but we encourage you to sign up so that you receive timely information about the space and the process. By registering you will receive invitations to view the space (which is not publically accessible) and opportunities to be part of the conversation that will help shape the future of the Hub. What will you do with the idea I submit? Your ideas will help us better understand the opportunities, challenges and potential gaps in the current vision for the Arts & Innovation Hub and will help refine and shape the vision of the Arts & Innovation Hub. We will use the ideas we receive to refine the vision for the future development of the Arts & Innovation Hub. You may identify as confidential, by way of yellow highlight, all personal information or commercially sensitive information within the Submission that you wish not be made public by CMHC, without prior consent. Will participating in the Call for Ideas process give me priority for space in the Hub? No priority will be given as the Call for Ideas phase is not a process that involves adjudication. During the Expression of Interest (EOI) phase, currently scheduled for 2019, all formal EOI submissions received will be evaluated and considered for inclusion in the Arts and Innovation Hub. You will receive notice of when the call for Expressions of Interest is issued. I give my consent to be emailed and to have my information stored and managed by Granville Island.